Kofi Annan in Uppsala in 2013. This weekend the news reached the world that former UN Secretary-General Kofi Annan had passed away. Kofi Annan was Secretary-General of the United Nations between 1997 and 2007. Tributes have poured in from around the world for his diplomatic achievements and his efforts to resolve conflict. In 2001, Kofi Annan and the United Nations were awarded the Nobel Peace Prize. In 2007, he received an honorary doctorate from Uppsala University during the University’s celebration of the three hundredth anniversary of the birth of Linnaeus. 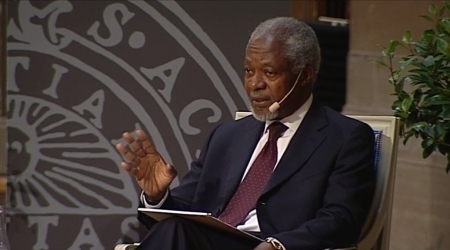 Kofi Annan gave lectures at the University on several occasions, including the Hammarskjöld Lecture in 2001 and most recently a lecture in September 2013 that filled the Grand Auditorium. The University will fly the flag at half-mast for his funeral.